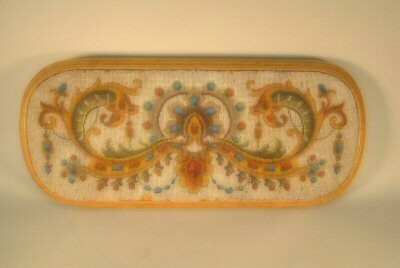 Typical Victorian beaded tray, lovely pattern. Sellers description: Victorian Beadwork Mounted on Custom Oak Board Marked Sheffield England, A great piece of Victorian beadwork. Scroll pattern in gold blue and red with a grey background. 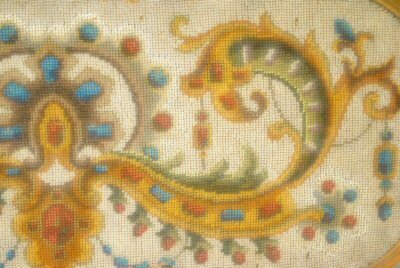 Intricate beadwork is still in very good condition, there are some missing bead areas along the border. Piece is mounted on a custom oak board with small bun feet (one foot is missing). Very unusual piece to add to your vintage beadwork collection. Dimensions are 22" wide by 9" deep by 3" tall. Permission to use images by ebay seller lefflerantiques, charted by Sytske Wijnsma.